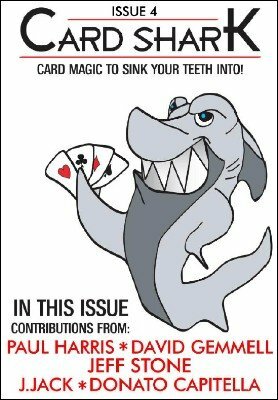 Welcome to issue 4 of Card Shark, the highly anticipated monthly card magazine that contains awesome tricks from magicians around the world. This issue contains six great tricks, that will feed your card magic needs. You will get six brilliant effects, from Paul Harris, Jeff Stone, J. Jack, Donato Capitella, David Gemmell and me. Fingerprints of the Kings by Donato Capitella – This new trick from this new name in card magic is simply brilliant. It has a fantastic presentational hook thanks to Dai Vernon, and it oozes commerciality. A great card trick. Signed Transpo by David Gemmell – A really clever and simple transposition between two signed cards. Brilliantly routine, brilliantly simple. This first appeared in Dave's Ebook: Unfinished . PACC 2 by J. Jack – An upcoming name in magic contributes a cracker of a trick, that will rock your socks. An awesome prediction and transposition effect. This is a new trick. Cincinnati Two – Faced Blues by Paul Harris – A great gem from his AOA series. Two advertising cards magically fuse in the spectator's hands. Classic chunk of Paul Harris. It first appeared in his book Art of Astonishment Vol.2. BONUS – Overture Underture by Kyle MacNeill – A nice little quickie, and a bonus I think you'll enjoy. It's my variation on Overture by Phil Goldstein, and it is jam–packed full of awesome magic, finishing with a double sandwich ending. This trick is new, and is a nice little bonus trick. 1st edition 2012; 20 pages.